Moon Jae-in implies a subtle change in position over THAAD. August. 10, 2016 07:05. by 한상준 기자alwaysj@donga.com. “The government should make all-out efforts to convince China and prevent a worsened bilateral relationship, even if the THAAD becomes real,” Moon Jae-in, former leader of the main opposition Minjoo Party, wrote on his Twitter on Monday, claiming that the prior diplomatic issue for Korea is preventing a damaged bilateral relationship with China over the THAAD deployment issue. His comment implies a possible change in his position on the deployment of the advanced THAAD anti-missile systems, although very subtle. It is notable that the former opposition leader did not take a clear opposition against the issue. About a month ago, he had virtually objected the THAAD deployment by saying that the government needs to reconsider the issue and listen to public opinions. His comments this time seem to be based on an assumption that the THAAD system is actually deployed, saying “even if the THAAD becomes real.” This is not in line with the opinions of the party leader candidates, Kim Sang-gon, former head of the party's innovation committee, and Rep. Chu Mi-ae, who claim for "anti-THAAD" as the party’s official opinion. 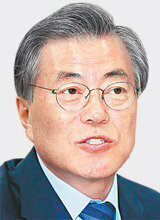 Moon denounced the presidential office Cheong Wa Dae for its efforts to dissuade six new party members' China visit. Rep. Kim Kyung-soo, a close ally of Mr. Moon, explained that Moon’s recent comment was a criticism against the government that had been ignorant on making diplomatic efforts, which has nothing to do with the stance over the THAAD issue. “What’s important is how we balance between national interest and North Korea’s nuclear issue,” Kim said. “The government should make all-out efforts to convince China and prevent a worsened bilateral relationship, even if the THAAD becomes real,” Moon Jae-in, former leader of the main opposition Minjoo Party, wrote on his Twitter on Monday, claiming that the prior diplomatic issue for Korea is preventing a damaged bilateral relationship with China over the THAAD deployment issue. His comment implies a possible change in his position on the deployment of the advanced THAAD anti-missile systems, although very subtle.